Advertisement poster for the film's re-release. Wake in Fright is a 1971 Australia-American thriller directed by Ted Kotcheff. The film chronicles one man's hellish experience in a fictional town in the Australian outback. Based on Kenneth Cook's 1961 novel of the same name, and the film was initially received favorably by many. There was some controversy due to a scene in which multiple kangaroos are seen being shot to death (often messily and cruelly); the hunting footage was taken during a real kangaroo cull, which only ended when the crew orchestrated a power outage as an excuse to end filming. The professional hunters hired for the scene were said to be heavily intoxicated at the time, accounting for their poor aim, the results of which both angered and disturbed many of the crew members. Twelve people are said to have walked out of the film's premiere at Cannes in 1971 (where it was screened under the name Outback) during the aforementioned controversial scene. For years, the film enjoyed the reputation of being Australia's quintessential lost film, having never had any home media releases made the available bar the occasional TV broadcast. Eventually, the master reels (and all other known copies of the film) were also lost. A single print was re-discovered in Dublin in the early 1990's. Unfortunately, the print was not considered viable for a commercial release of the film, nor was it deemed good enough quality to warrant being cleaned up and remastered. 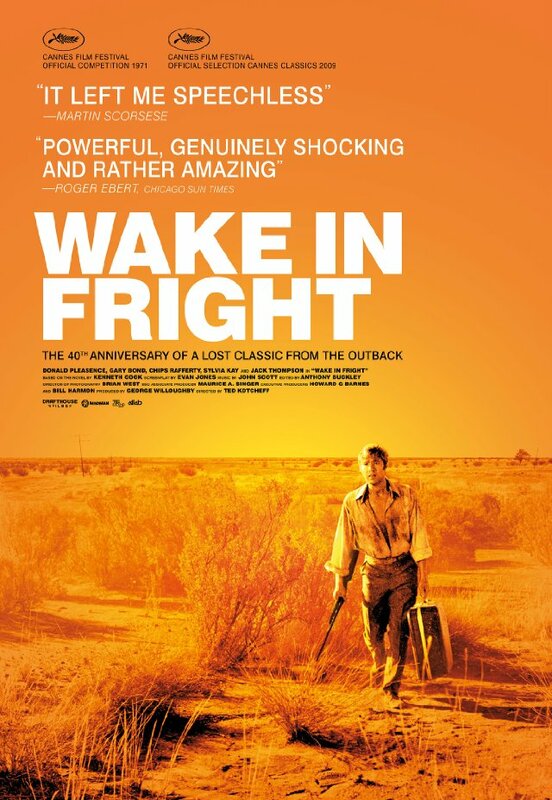 Desperate to save Wake in Fright from its otherwise inevitable fate, the film's editor, Anthony Buckley, set out to recover an uncut, good quality print of the film in 1994. In 2004, Buckley traveled to Pittsburgh, and, to Buckley's amazement, and under incredible circumstances, an uncut copy of the film was discovered in a shipping container marked "For Destruction." Reportedly, if he had not recovered the negatives when he did, they would have been destroyed one week later. With a secure, workable copy of the entire film recovered, the painstaking process of restoring it began. Five years after Buckley's miraculous discovery, the restoration was completed and was premiered at the Sydney Film Festival in June of 2009 to rave reviews. A few months later, the film was released on DVD and Blu-ray.